Here is one species of Melanoleuca that is not an identification nightmare. 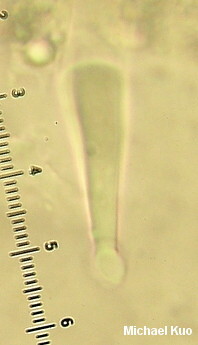 Like other species in the genus it features a white spore print, attached gills, a nearly flat cap, and a tough stem. Unlike the other species, however, Melanoleuca verrucipes has prominent dark brown to black scabers all over the stem surface. On our continent the species appears to be limited to urban areas, popping up in landscaping, woodchips, and grassy areas along roadsides. The illustrated collection is an example of what a selfless, popular, easy-to-talk-to, devoted mushroom educator is capable of (and no, I am not talking about myself; have you met me?). Gary Lincoff, author of the Audubon Field Guide to North American Mushrooms and, without doubt, our continent's most revered and adored mushroom guru, found the illustrated mushroom while scouting for a foray in Pennsylvania (appropriately, the Western Pennsylvania Mushroom Club's annual Gary Lincoff Foray) . . . and let it sit there on the chance that a foray participant would come across it the next day. Sure enough, the little specimen showed up on a paper plate—one of hundreds—awaiting identification, and Lincoff was able to teach participants (including a very thrilled collector, and Yours Truly) about this rarely-seen species. Thanks to Gary Lincoff for use of his photo, representing the described collection before it was collected. 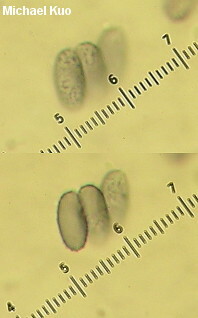 Ecology: Saprobic; growing alone, scattered, or gregariously in soil or woodchips; in boreal and montane Europe found "naturally" in grassy areas, but elsewhere in Europe found in landscaping areas; in North America found in the Pacific Northwest and in the northeast and mid-Atlantic states, in woodchip beds and other landscaping areas, or in grassy ditches and along roadsides; spring through fall. The illustrated and described collection is from Pennsylvania. Cap: 3 cm across for the illustrated collection (up to 10 cm according to the literature); broadly convex or nearly flat; dry; bald; white; the margin not lined. 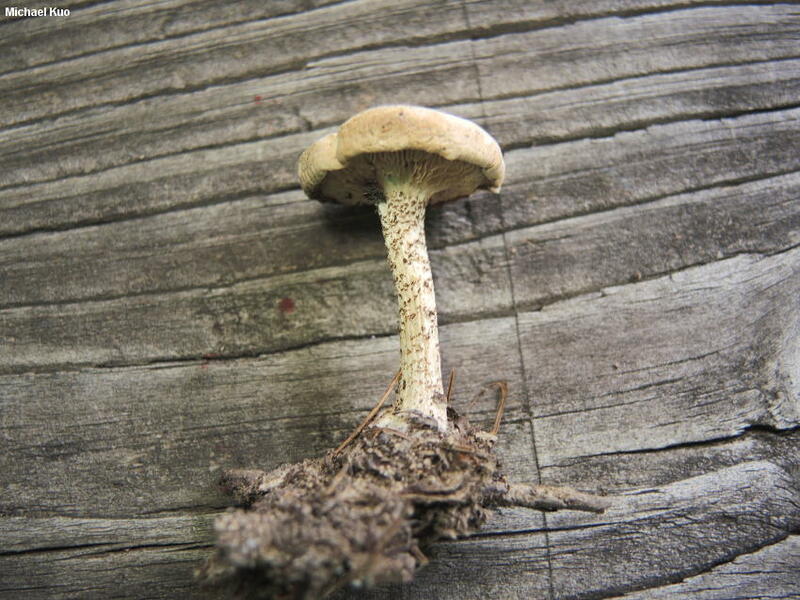 Gills: Broadly attached to the stem; close; short-gills frequent; white, becoming brownish with age. Stem: 4 cm long and 0.5 cm thick for the illustrated collection (up to 6 x 2 cm according to the literature); equal with a slightly swollen base; dry; white underneath dark brown to nearly black scabers. 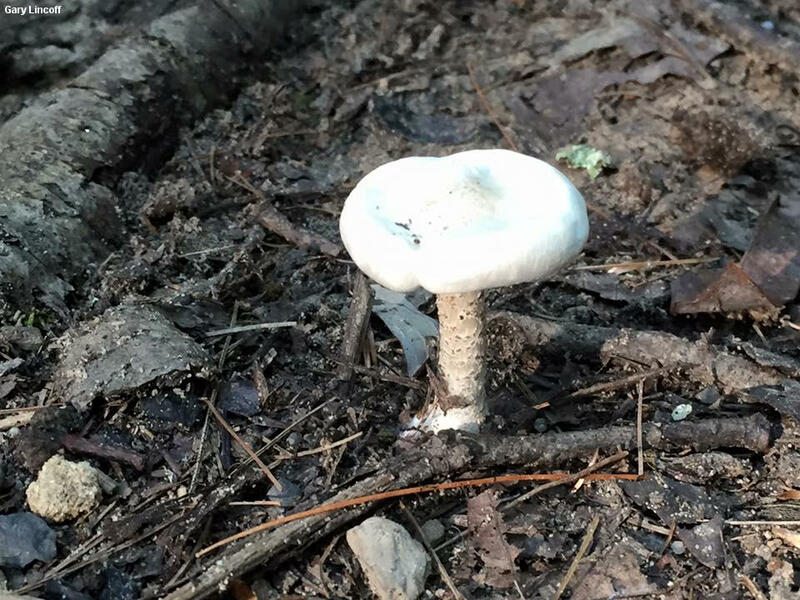 Spore Print: Not verified by me; reported as white. 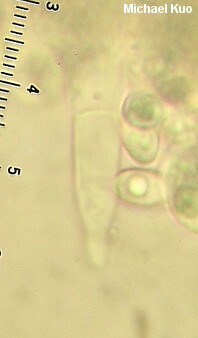 Microscopic Features: Spores 7–10 x 3–4.5 µm; long-ellipsoid; finely verrucose with amyloid warts under 0.5 µ high. Basidia 4-sterigmate. Cheilocystidia not found. 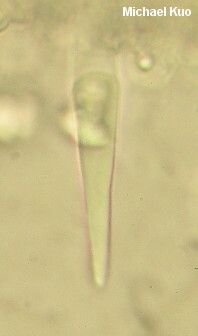 Pleurocystidia 50–65 x 5–7.5 µm; fusiform with a narrow, acute apex; septate once; ventricose beneath the septum; thin-walled; hyaline in KOH; apex occasionally encrusted with crystals. Lamellar trama subparallel. 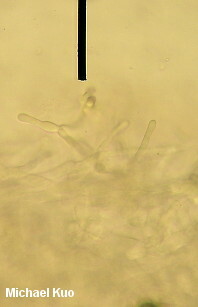 Pileipellis a cutis of elements 2.5–7.5 µm wide, septate, hyaline in KOH, smooth; terminal cells often upright, cylindric, with rounded apices. Clamp connections not found. REFERENCES: (Fries, 1872) Singer, 1939. (Saccardo, 1887; Moser, 1983; Breitenbach & Kränzlin, 1991; Boekhout, 1999; Vesterholt, 2008.) Herb. Kuo 09191503.